He was taken to task by some critics who asked, Do you write the words or lyrics first? These 2017 NFL season Picks, certain that the Cleveland Browns will win the Super Bowl, if there is a Super Bowl, are afraid of a crazy man on Twitter, whatever Twitter is. I have heard that World War III is likely to start on this Twitter thing, which would probably cause the Super Bowl that the Cleveland Browns are going to win to be cancelled. That would be sad for Browns fans. If there isn’t a nuclear war, the second escape hatch from some crazy thing I just heard about called, impeachment, is civil war. I am not good with history but I think this plan has something to do with people attached to a statue of Benedict Arnold. A civil war might also cause the Super Bowl that the Cleveland Browns are going to win to be cancelled. To reiterate, that would be sad for Browns fans. The Cleveland Browns play in a place officially called, The Factory of Sadness. They do not need any more sadness by not playing in the Super Bowl they are going to win just because of a couple of stupid catastrophic wars. As you can obviously tell, these 2017 NFL season picks are printed on fine stock paper and have been delivered to your doorstep by my friend named… well never mind about that. He’s not from this country. This brings me back to Twitter, something I have not seen because I have never been on the Internet. By holding this nice stock of paper in your hands right now, you are probably also the type of person who wonders what Twitter is. It turns out that a crazy person lives there, right on Twitter. My friend, Pedro told me that there is a crazy, semi-literate man on Twitter who wants to get rid of people like himself. Did I say Pedro? Never mind about that. Pretend I said name like, I don’t know, how about Donald? 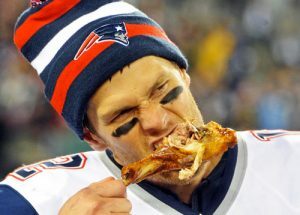 Tom Brady eating grilled unicorn. Anyway, having heard about this thing called Twitter and this crazy man who uses it during his very emotional 5 a.m. bowel movements, I am even worried about the President of the United States favorite quarterback, Tom Brady. Tom Brady, on a diet of acorns, seaweed and grilled unicorn, is playing at 40 and has shown zero signs of the aging that has affected every other quarterback in NFL history before they hit his age. He is the President’s favorite quarterback. So my hope is that the President of the United States can stop the crazy, semi-literate buffoon on Twitter from setting off a nuclear war, which would cancel the Super Bowl that the Cleveland Browns are going to win. 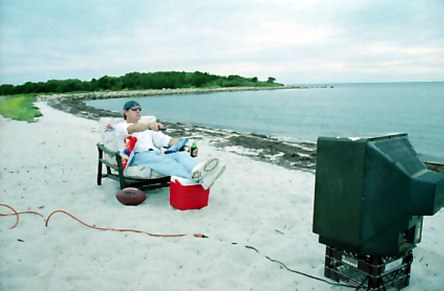 I want Cleveland Browns fans to be happy, or at least alive this Super Bowl. This column is sponsored by news you just can’t fake.